With over 40 years combined experience in transport and the delivery of bulk fuel at competitive rates, Strike Fuels management team have the knowledge and expertise to assess the needs and demands of your business and tailor a fuel solution specific to those requirements. At Strike Fuels, we pride ourselves in extracting value for your business with a wide range of Tank and Fuel Management Systems suitable across many industries. 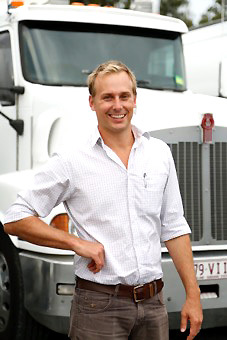 Leading our team is Drew Morland, a third generation fuel distributor. Coming from a long family history in fuel at a retail level, Drew recognised the need for owners to have complete control over what is often the largest cost-centre in their business. Drawing on his grass-roots knowledge of the industry, he has expanded and evolved the common concept of selling bulk fuel to offer innovative, tailored solutions that merge seamlessly within your current business operations adding value through transparency and in-house efficiencies. At the core of all that Drew promotes, his primary focus is for Strike Fuels to be a continually evolving, customer-focused, adaptable and approachable partner to do business with.